As you may know I have a little thing for peppers. I know shocking, huh? 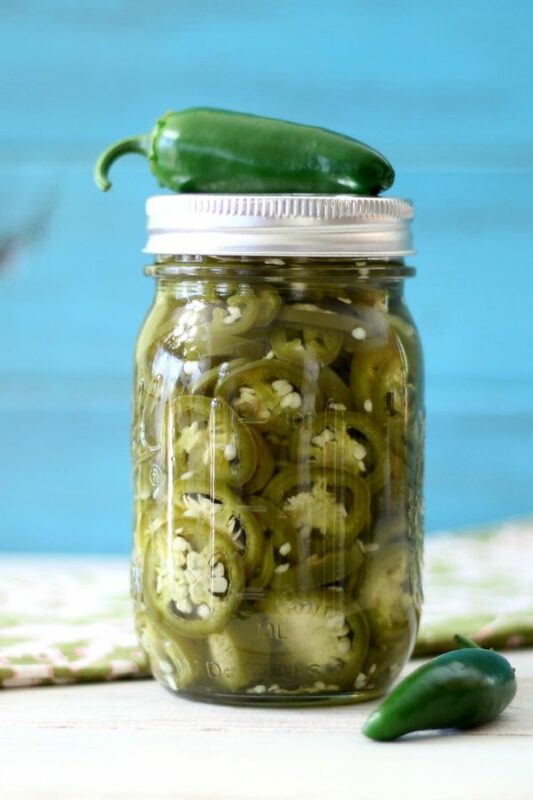 Well today I took one of my all time favorite peppers, the jalapeno and made a recipe that is so simple, inexpensive and darn good, that I can’t believe I waited so long to make it, crazy! 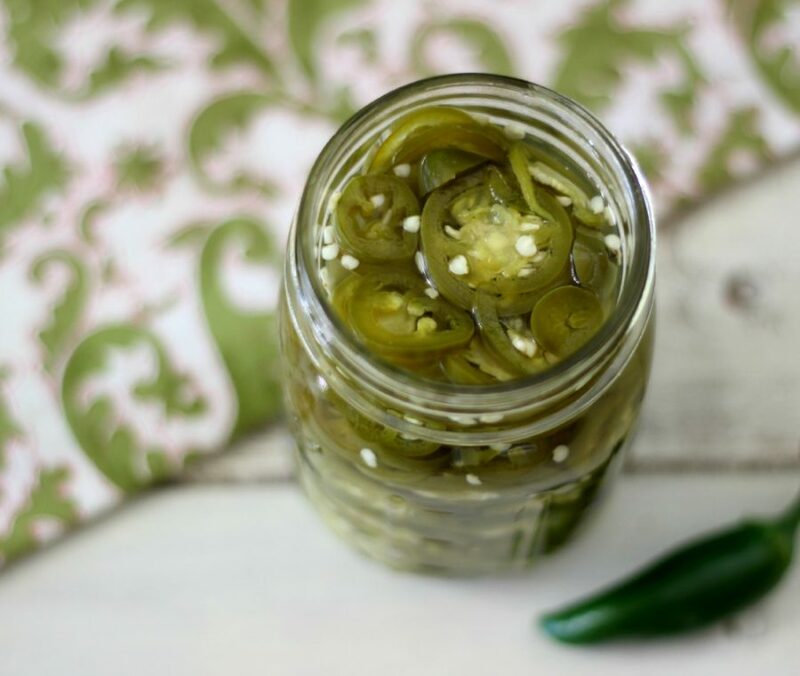 So today’s recipe is Pickled Jalapenos! Oh yeah!! 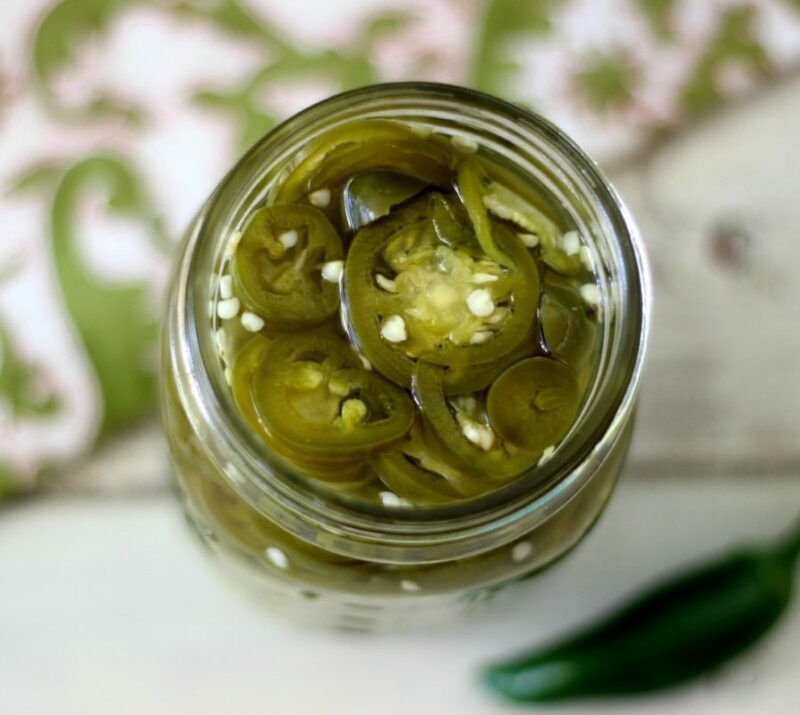 I know you can buy jalapenos in a jar already pickled, but you know what, this is so easy and they taste so fresh, plus as I mentioned above, it’s pretty cheap to make! 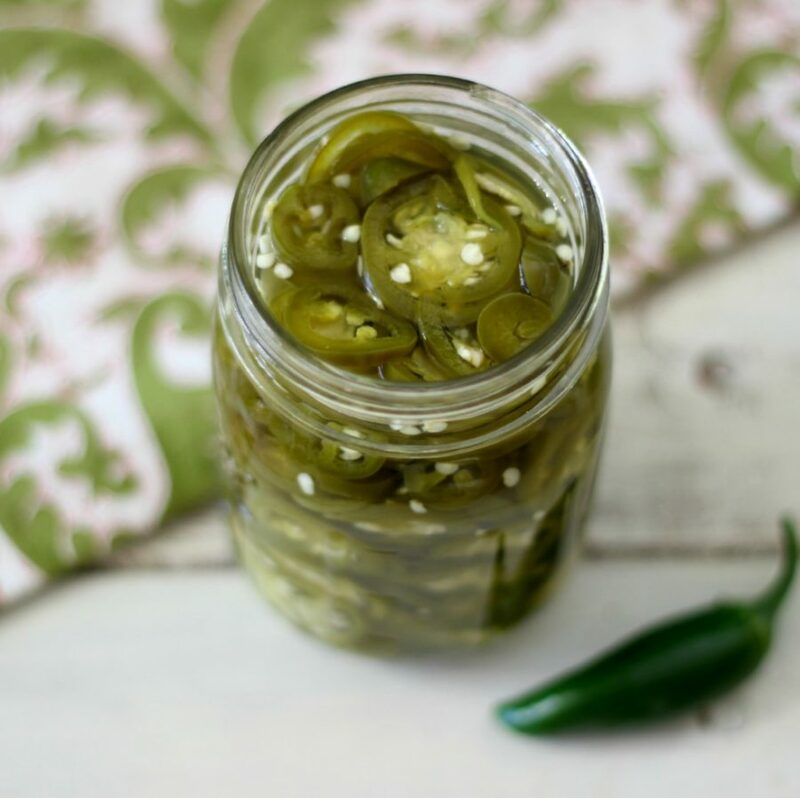 A jar of jalapenos cost about $1.99, but my recipes costs oh about .70 cents! I bought my jalapenos at the Farmers Market for .50 cent, but they are about .03 – .05 cents a piece at the grocery store. I planted my own this year, but unfortunately my zucchini plant got so big that it covered up my pepper plants and they didn’t make it do to lack of sun and water. So I bought my own! Let me give you some advice when making this recipe! If you want the peppers less hot, add more sugar to the vinegar mixture. I would say about 3 tablespoons to 1/4 cup. When handling the peppers, wear gloves! The oil from the peppers can burn your hands. Wash your hands immediately after handling the peppers. If your super sensitive to peppers, where a mask or ask someone else to cut them for you. I am highly sensitive to peppers, as it makes it hard for me to breathe. I hold my breath and slice away. I am a glutton for punishment. Thinly cut jalapenos, make sure they are about all the same size slices. Rinse under cold water; set aside. In a large pot, add vinegar, water, salt, sugar and garlic. Bring to a boil. Turn off and add the jalapenos. Push the jalapenos down so they are all submerged. Let the jalapenos sit for 15 minutes. 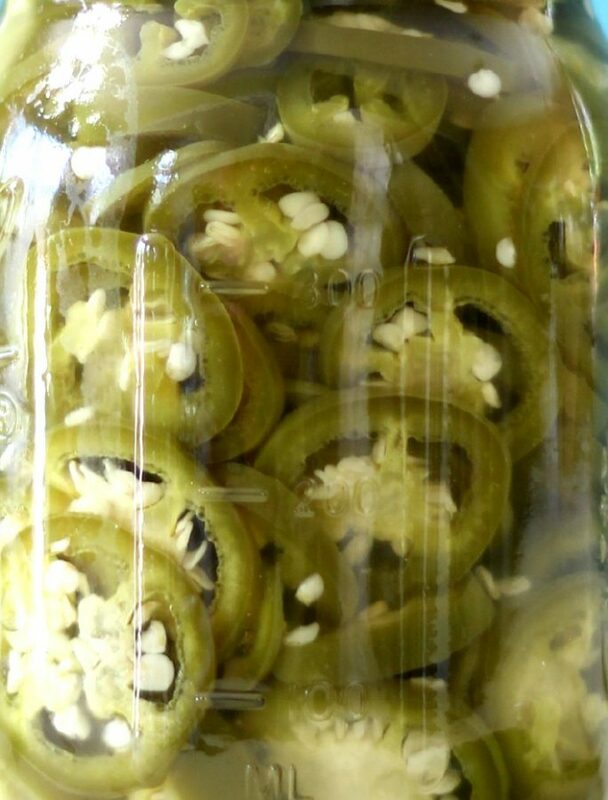 Scoop the jalapenos out and place in an 8 oz sterilized jar. Spoon over the juice from the pan until filled to the top of the jar. Cover and let it sit on the counter until it reaches room temperature. Place in the refrigerator. Note: To make less hot in flavor, add up to 3 tablespoons of sugar. I totally had fun with this recipe! Now I can put these jalapenos on burgers, tacos, salad, crackers, spoon them in my mouth and more! I think I am going to make the same recipe but use banana peppers instead! Yum! Bought a big batch of jalapeños at a farmers market for canning salsa. Had a bundle left over and didn’t know what to do with them – hate to waste! Well, now they are pickled and in the fridge! Thanks for saving my jalapeños! Ha ha! I do what I can to save a pepper! 🙂 I bet your salsa turned out wonderful!! I have had my pickles for 3 weeks and they are still good. I would imagine they would be good for up to month. I just checked my peppers in the fridge and they are from 11/2014 and still just fine, I also have candied Jalapenos that are great and they were done the same time. When you make pickles from cucumbers they stay just fine too. Like a previous post says, there really isn’t anything to spoil. I see that this is not a canning recipe, but is there a reason to not can them like I would pickles? Anyone who likes spicy food, is going to laugh at only 10 peppers to a jar. 10 peppers is not a lot.but for anyone one who want’s a bit of spice this is good for them. Myself when I am not that hungry or don’t want to cook. I put on KD, got to add the peppers and sriracha sauce. Only way to make it taste good. How long after making them are they ready to eat? I ate mine right away, well once thy cooled, there good to eat! I saw the recipe and questioned when I read equal parts sugar to salt, and regretfully, went ahead and made the pickling liquid. When I tasted it I knew I should have listened to my gut. Way too salty! Maybe it should read 1 tbsp sugar, 1 tsp salt?? Sorry Barry. I didn’t thin it was too salty, my apologize that the recipe didn’t turn out for you. Hi Dana, I would say about 2 weeks. I made these last week because my hubby is a jalapeño junkie and we had a great crop of peppers. They are delicious- and almost gone already! Thanks for the recipe!! If I seal the jars will they last longer or is there something that you need to add to peppers to last longer? Hi, yes they will be ok. You do not need to add any extra. Let me know how it turns out. I love this recipe. I have a small garden and want to use my peppers but never have enough to make multiple jars at once. By the time one jar is eaten, I have enough out back to make more. Thank you show sharing such an easy and useful recipe. Does the garlic go in the jar or is it discarded before the jarring process? why do you say this is not a canning ? I just canned 5 pints and now I dont know if the will be any good. what do you think? I have used sea salt, but if you have just regular salt, that will work too. When canning something, if it uses vinegar it doesn’t need to be heated. The vinegar brines it and it will last almost forever. Other than vinegar will need to be pressure canned or water bathed to seal the jars to keep bacteria out that makes things spoil. There is lots of info on internet about what to water bath and what to pressure can. I look forward to making pickling peppers this afternoon. Thank you Beverly! I am still new to canning. I really want to learn it. It’s a great way to preserve vegetables and fruit. I hope you enjoy the pickled jalapenos. Reminds me I need to go outside and pick more. 🙂 Have a great rest of the weekend! can you use the brine that is left after you use the peppers ? recycle the brine..
Hi Marilyn, I love this recipe, it’s so easy, and I am sure your Husband will enjoy!